I like the idea of a big flag to show support for Birmingham City but I don’t usually donate money without knowing where it’s going and I don’t know much about the people who are planning to get the flag made. I know there’s a connection with the BIHL GO NOW campaign but that’s not much help since I don’t know the people running that either. Nor do I know the real names of those who go by the names of PIMO and minotaur on the SHA forum. 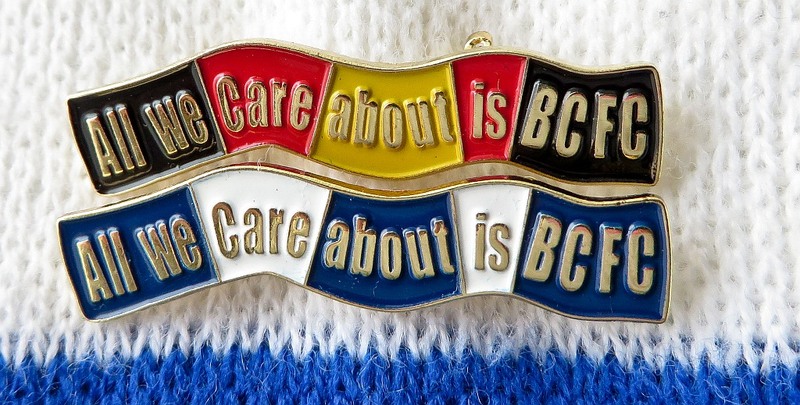 I like the slogan “All we care about is BCFC” because it is supportive rather than abusive. Over 600 supporters have shown their agreement with it by buying a scarf with it on. Also, this slogan can be used when the present crisis is over. I am hoping that there will come a day when “Delay No More” and “Destroyed in Hong Kong” will no longer be relevant. If there are any wealthy supporters wondering about buying Birmingham City FC, they will be looking at the club’s assets, including the fans. Fans getting together to support the club might encourage them to make an offer. It might encourage the players too. We might even get a win at home! This entry was posted in Birmingham City FC, Football and tagged AWCA, Big flag, BIHL go now, Birmingham City F.C. on February 22, 2014 by Puddleglum. “If there are any wealthy supporters wondering about buying Birmingham City FC, they will be looking at the club’s assets, including the fans. Potential investors will firstly look at the revenues generated, and the fanbase that exists – i.e. Attendances and Marketing Potential. To take a simple example..Leeds. They have maintained a high attendance level, even for minimal success. They have been courted, not by local, loyal and rich supporters, but by foreign banks and venture-capitalists. We have a dwindling and ageing loyalty base that would need a subsidy on prices to regain a healthier attendance and marketing potential by any investor(s). Getting children in NOW, to sell to them in years ahead. Getting families in NOW to cement a a shared experience that resonates in years ahead. This can’t be done without a drastic cut in prices, imo. To do that and to gear future marketing to a low and regular, affordable matchday must be the way ahead. The HK view seems to be..Blues as a resurrected cash-cow. The Ideal owner would see Blues as the real SLEEPING GIANT…the original sleeping giant. A term first read in the mid-sixties about us, and now just a cliche about any wannabe Premier team. Yes I do agree that prospective buyers of the club, will look at the fan basel I believe the club shot themselves in the foot when they closed the upper section of the Gil Merrick stand. What they should have done, was kept that section open as a ” families.” area. An adult with at least one child at reduced rates. I know one or two people who can’t afford to go to matches, because they have two kids and that makes it an expensive day out. As a season ticket holder in the Tilton, I would not object to reduced rates for parents with kids. The kids would then , hopefully, become season ticket holders in the future. Those of us of a certain age can remember a song played as the teams ran out by “Harvey Andrews”,,,,”Come wind rain sleet or snow, If The Blues are playing I,ll be there, its in my blood and I dont care,if the Blues are playing I,ll be there. If the blues are playing, I’ll be there.